So on the theory that the autopilot would be happier, which makes me much happier – constant steering uses up way too many stamina points in a given amount of time – I turned north into Blue Hill Bay, on the west side of Mount Desert Island and Acadia National Park. I was grouchy about this, and frustrated that, because of timing related to an outside world commitment, I did not continue sailing two days before when the wind was perfect and easy. That day there was not even any traffic, with the lousy weather forecast and obvious rain coming. Given a similar choice in the future, I’ll be sailing! However, I’ve been having quite a bit of fun, regardless. Sailing up Blue Hill Bay wasn’t so easy, because the wind farther up the bay was northwest, instead of west or southwest down where I first turned. But it was fascinating watching the transition. I even got faked out and turned back south, thinking that the wind had shifted northwest everywhere. Shortly I was back in the west/southwest area… turning north again. First I thought that the lobster boats would think I was a little crazy, but then I decided I would just look like a daysailor, even though that’s something I almost never do (daysailing – who knows what I look like!) Then it was back to tacking north, struggling to turn the corner past Moose Island. That night – after a long day of fussy sailing – was spent at the north end of Bartlett Narrows, which was quite pretty and fairly peaceful. The goal was Mount Desert Narrows, for a little wild fun going the long way around the island. The vertical clearance for the highway bridge that crosses the Narrows is 25 feet at high tide, and quite a bit more when the tide is down. This boat only needs 20, so that looked fine. No information on the current, in either the current tables or cruising guides. And mention in one of the cruising guides that the shallow channel is entirely unmarked. Oh, I said, they probably have sticks or something put out by the local people… but just to be on the safe side I waited for half tide, rising, to give it a try. The chart shows about 1 foot of water in the channel at low, and surrounding mud flats as well as rocks (this boat needs a little less than 2 feet in order to stay floating). Half tide would mean about 6 feet of water in the channel, and likely water over the mudflats. I figured if worse came to worst and I stuck on one of the mud flats, perhaps with current problems, I would just let the anchor down and wait for another hour or two of water to arrive. As it turned out, I scooted through without mishap, but it was fascinating. No local markers. In the wide entrance before the bridge, no current. 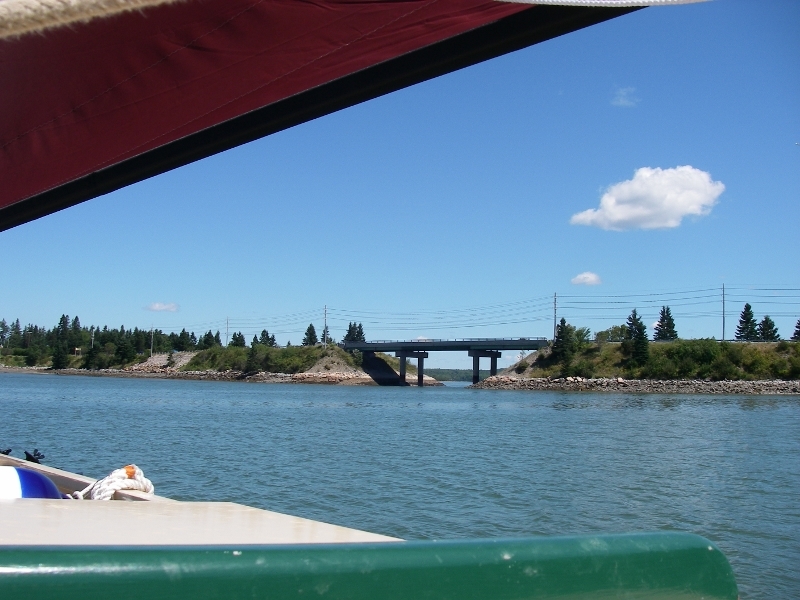 Under the bridge, about 2 knots running westbound, but I had a good breeze behind me. Actually, it was nice to have the opposing current, which helped slow the boat with the wind directly behind. The bridge pylons aren’t very far apart, so it was nice to go at a more moderate, controlled pace. I had considered reefing ahead of time, but was worried about losing the wind under the bridge and having to deal with whatever current I was going to find in that tight space. So too much sail felt like a better option than not enough – bridges are notorious for completely blocking the wind while you are under them, which can get very stressful if current starts pushing you toward the pylons. The trickiest part with the channel issues in Mount Desert Narrows is on the east side of the bridge, and the water isn’t as clear as most of the coast. At one point I saw weeds about a foot down, indicating a rock just below that… mostly through cosmic grace, no other rocks materialized so close, and I never did see the mud. I took my best guess at the more southerly channel, swinging around toward the shore and staying away from the big rocks in the middle. No current on the eastern side either – just in that tight little squeeze under the bridge where the Narrows are practically dammed off for the highway, with just one little gap that’s an actual bridge. So that’s my adrenaline story for the day! Then several more hours of fussy sailing, with the wind shifting all over as it moved around the thousand foot mountains of Acadia. It actually would have been less hand steering to have just sailed west from the beginning – but I’ve had a great adventure! I don’t think I’ll go around this way again, but it was really fun to do once. Now I’m near the north end of Frenchman Bay, in the Eastern Harbor at Sorrento. Thank you Kent, for pointing out this harbor! I’m anchored in a small bit of a cove on the south side of the harbor, right underneath my own personal steep rocky cliff! The light wasn’t right for a picture, but maybe in the morning. It’s very, very beautiful. Tonight a meteor shower is forecast, so the anchor light is going to have a vacation, and I’m hoping that the clouds and the fog hold off. It’s a tossup about tomorrow – maybe a day of rest!